Just like bicycle riders reduce effort when riding together in a pack, Brownie’s has found a way to reduce the work required by any single diver by dispersing the load over the entire group. Our unique Peleton™ Hose System utilizes a single larger diameter hose as a main down line. Up to 4 individual 20 ft diver hoses can be attached (depending on the system being used) to provide the optimum amount of efficiency while maintaining single diver freedom. 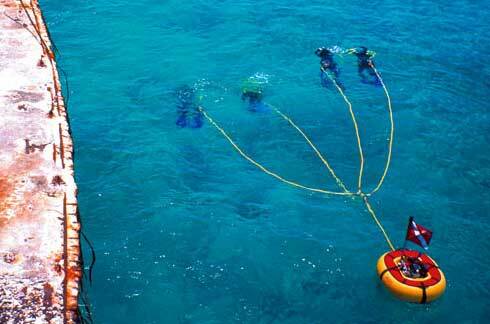 • Share the Workload - Long individual diver hoses can tend to pull the float in different directions, creating a zig zag pattern on the surface and a tug-of war effect. One diver is effectively always pulling the entire weight of the float. The Peleton™ pattern utilizes the efforts of all the divers in a single direction. The net effect is greatly reduced work required by any single diver. (Think of it as divers acting like a team of horses.) You almost forget the float is even above you. • Drag - Very simply put, less hose in the water creates less drag and requires less effort. • Weight and Storage - Even though our hoses float on the surface, they still have weight out of the water. 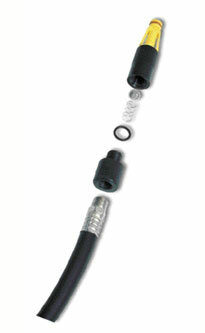 A 4 divers Peleton™ hose set in a Brownie’s Hookah System weighs around 16 lbs. A comparable set of individual 80 ft diver hoses for 4 divers would weigh approximately 32 lbs - twice as much! • Buddy System - 20 ft of hose per diver allows up to 40 feet of distance. That’s enough separation for independence and exploration yet close to your buddy. • Entanglement - Avoid the “spaghetti” typically formed by numerous long hoses intertwining in and out of the water. The Peleton™ configuration makes deployment, recovery and clean-up simple. • Swivel Fittings - Brownie’s proprietary Quick Release Swivel (QRS) hose fittings greatly reduce the chance of kinks. Our Quick Connect feature makes assembly and break down a snap. Newly reformulated material is lightweight and even more resilient and impact resistant. These fittings will never “bind” like brass fittings can from repeated exposure to salt and sand. They also weigh half as much and won’t scratch your gel coat! Another Brownie’s™ exclusive! Our proprietary design cuts hose assembly time by over 95%. 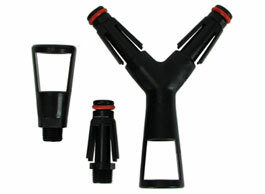 Connect or disconnect hoses in a snap, this allows you to customize your hose configuration in seconds. An audible “click” confirms the connection is secure. To prevent accidental separation, two hands are needed to disengage the connection. The swiveling design reduces kinks and tangles while you dive. Located just past the black heat hose, a particle filter assures that no debris enters air lines or lungs. Only hand tightening with o-ring seal is required for instant filter replacement. Kit includes stainless steel filter and o-ring.